Sumalate® has 40% absorption. This high absorption is due to the chelation. Iron is surrounded by glycine and aspartic acid which are important amino acids in aiding in iron absorption into the enterocytes. Since absorption is increased, mucosal block is limited and hepcidin is less likely to be released and inhibit ferroportin, the channel which moves ferrous iron out of the enterocytes and into the bloodstream. Therefore, it can be said chelated metals increase expression of ferroportin. Because the iron is chelated, it participates less in chemical reactions such as those with absorption inhibitors. Sumalate® can also be absorbed in the proximal or distal duodenum due to its chelation and bioavailability, and therefore is not limited to the proximal duodenum like ferrous salts. 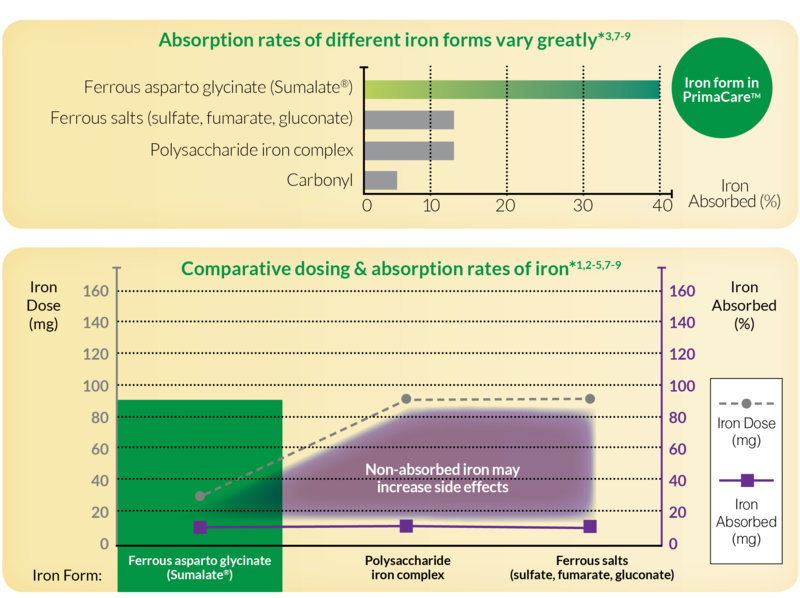 *Bioavailability ranges for irons can vary greatly and may depend on iron form, dose, dose regimen, and other ingredients in the product formulation. Representative bioavailability is dervied from published studies of the iron forms alone. References: 1. Primacare™ prescribing information, Avion Pharmaceuticals, October 2016. 2. Kamdi SP, Palkar PJ. Efficacy and safety of ferrous asparto glycinate in the management of iron deficiency anaemia in pregnantwomen. J Obstet Gynaecol. 2014; Early Online: 1–5.doi:10.3109/01443615.2014.930098.Accessed December 29, 2014 3. Pineda O, Ashmead HD, Perez JM, Lemus CP. Effectiveness of iron amino acid chelate on the treatment of iron deficiency anemia in adolescents. J App Nutr. 1994; 46(1,2):2-13 4. Data on File. Avion Pharmaceuticals LLC, Alpharetta, GA. 5. Bovell-Benjamin AC, Viteri FE, and Allen LH. Iron absorption from ferrous bisglycinate and ferric trisglycinate in whole maize is regulated by iron status. Am J Clin Nutr. 2000; 71:1563–1569. 6. Duque X, Martinez H, Vilchis-Gil J, et al. Effect of supplementation with ferrous sulfate or iron bis-glycinate chelate on ferritin concentration in Mexican schoolchildren: A randomized controlled trial. Nutr J. 2014; 13(71):1-10. doi:10.1186/1475-2891-13-71. Accessed January 5, 2014. 7. Zariwala MG, Somavarapu S, Farnaud S, Renshaw D. Comparison study of oral iron preparations using a human intestinal model. Sci Pharm. 2013; 81:1123–1139. 8. Jacobs P, Wormals LA, Gregory MC. Absorption of iron polymaltose and ferrous sulphate in rats and humans. S Afr Med J. 1979;1065-1072. 9. Devasthali SD, Gordeuk VR, Brittenham GM, Bravo JR, Hughes MA, Keating LJ. Bioavailability of carbonyl iron: A randomized, double-blind study. Eur J Haematol. 1991; 46: 272-278.